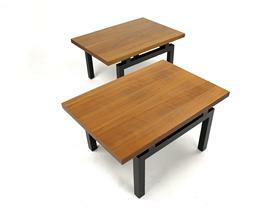 Stylish modern tables, with American Walnut tops and black lacquered bases. This is an extremely flexible and functional pair of tables. Designed to be used as movable bunching cocktail tables, or a pair period lamp tables, at a height typical of the era. These could even be used as a pair benches at the end of a bed.